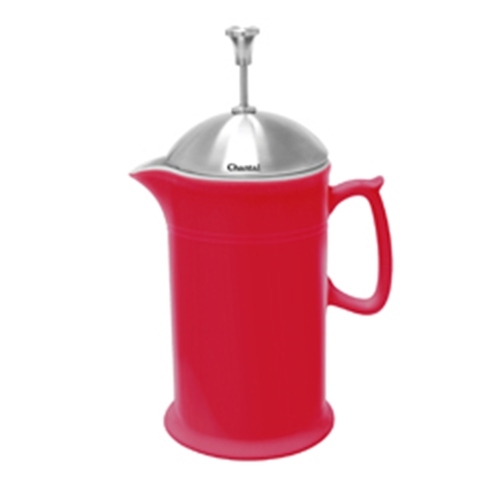 Brew your own coffee or steep your own tea with Chantal's uniquely designed Ceramic French Press! An essential eye grabbing piece in any kitchen, the unique thumb handle facilitates easy handling and pouring when you are ready to serve. The design of the body has a maximum fill line that precisely lets you know how much water to put into the carafe, preventing spillage. Stainless steel plunger includes a fine mesh screen which prevents coffee or tea sediments from escaping. The ceramic body is sure to keep your drink warm or cold, holding the temperatures longer than glass or stainless steel! 28 ounce capacity. Dishwasher safe.